This regular buyer has a very fierce lover. She will flare and get angry with him very often and quarrel. He contacted me and ask me how he can prevent him from all the scoldings. I teach him to to use the thai amulet and charms. He managed to escape all the unhappiness and scoldings. Dear nayan ,Thanks a lot for your recent help . 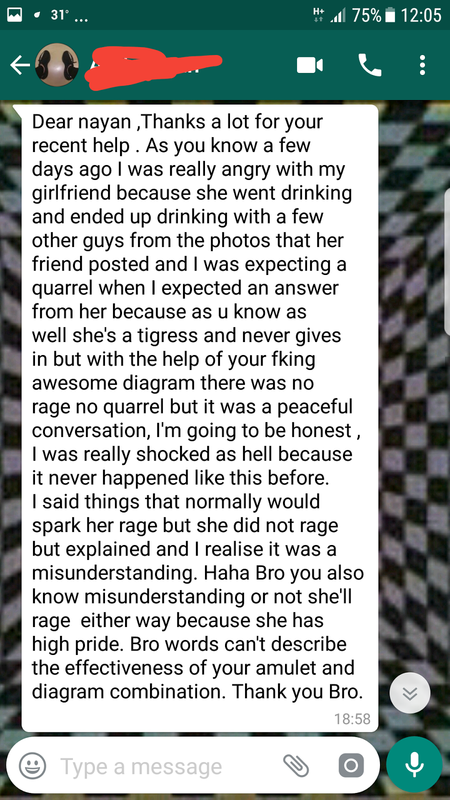 As you know a few days ago I was really angry with my girlfriend because she went drinking and ended up drinking with a few other guys from the photos that her friend posted and I was expecting a quarrel when I expected an answer from her because as u know as well she's a tigress and never gives in but with the help of your fking awesome diagram there was no rage no quarrel but it was a peaceful conversation, I'm going to be honest , I was really shocked as hell because it never happened like this before. I said things that normally would spark her rage but she did not rage but explained and I realise it was a misunderstanding. Haha Bro you also know misunderstanding or not she'll rage either way because she has high pride. Bro words can't describe the effectiveness of your thai amulet and diagram combination. Thank you Bro.